Two unique RNA viruses, the Marburg and Ebola viruses, are members of a new family known as filoviruses. These agents can cause severe or fatal hemorrhagic fevers and are endemic in Africa. Laboratory workers have been exposed to the Marburg agent while working with tissue cultures from African green monkeys. Travelers in or residents of central Africa (eg, Zaire or the Sudan) may be infected by the Ebola virus. 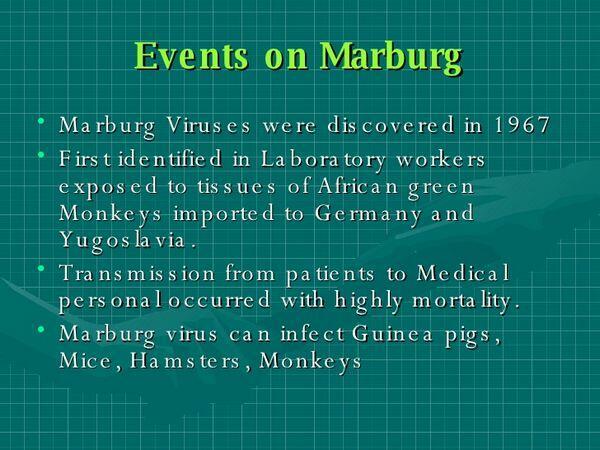 Marburg virus infection was first detected among laboratory workers in Marburg, Germany, who had been exposed to tissues from apparently healthy African green monkeys. However, it is not clear that these monkeys were, or are, the reservoir for this virus because inoculation of Marburg virus into these monkeys produces death rather than a carrier state. Rare cases of Marburg virus infection have been reported in Zimbabwe and Kenya. Ebola virus has caused disease only in Zaire and the Sudan. In rural areas of central Africa, = 18% of the population have antibody to this virus, suggesting that subclinical infections do occur. The source of the virus and means of transmission are unknown but are possibly simian viruses. Rarely, secondary cases of filovirus infections have occurred in healthcare workers, usually as a result of accidental needle-stick exposure. Filoviruses are single-stranded RNA viruses with a filamentous or threadlike appearance. The filamentous forms have a diameter of 80 nm but may vary in length from 1,000 to ~14,000 nm. Their symmetry is helical, and they are enveloped. Virus is replicated in the cytoplasm and is released by budding from the cell membrane. Illness usually begins with flulike symptoms such as headache and myalgia. Within a few days, nausea, vomiting, and diarrhea occur; a rash may often develop. Subsequently, there is hemorrhage from multiple sites and death. Lymphopenia followed by neutrophilia and severe thrombocytopenia. Direct fluorescent-antibody (FA) assay can detect viral antigens in tissues; virions can be seen by electron microscopy in serum or liver tissue. Isolation of the virus is the procedure of choice to diagnose filovirus infections. Marburg virus may grow rapidly in tissue cultures (Vero cells), although Ebola virus recovery may require animal (eg, guinea pig) inoculation. All specimens for filovirus diagnosis must be handled with extreme care to prevent accidental infection. IgG and IgM antibodies to filovirus antigens can be detected by immunofluorescence assay (IFA), enzyme-linked immunosorbent assay (ELISA), or radioimmunoassay (RIA). Seroconversion or a fourfold rise of IgG antibody levels is diagnostic of active infection, as is the detection of specific IgM antibody. 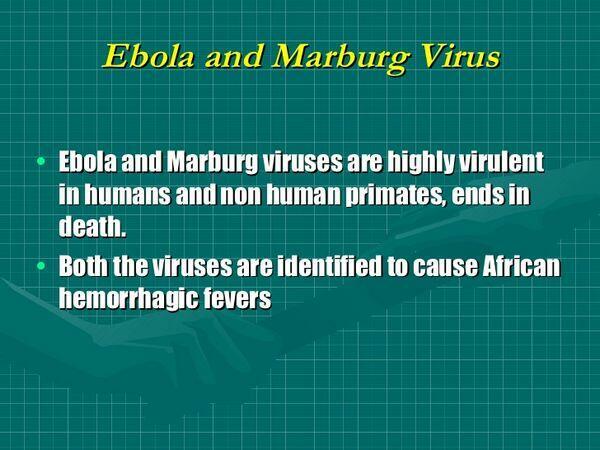 The mortality rate in patients with symptomatic Marburg or Ebola virus infection is = 80%. Since the source of filoviruses is unknown, no measures are available for preventing primary infection. Secondary cases in healthcare workers can be prevented by avoiding exposure to contaminated needles, blood, and so on.